With over 2,000 years of history, Sagunt has a wide range of remaining monuments which can transport the visitor back in time. It's simply a question of giving free rein to your imagination. The Plaza de Almenara, named the Saluquia by the Arabs, is the most Oriental part of the Castle, with ancient cisterns, Roman pavings and buildings from different periods. The arms patio, now called the Plaza de Santa Maria Magdalena, is the nucleus of the Castle containing remains of the Roman forum, temples, shafts and columns, and a cistern sculpted in rock from the Roman period. The Plaza de la Conejera once formed part of the Arab fortress. This is also known as the Pla‡a dels nou pilars, the nine-columned square, because of an ancient cistern located in its northernmost corner. Access is from the arms patio. The Plaza de la Ciudadela is the highest enclosure of the Castle. This was once named the Plaza de Hercules after a tower of the same name that withstood the ravages of time until the seige of the fortress by French troops in 1811. The Plaza del Dos de Mayo, looking to the west, received this name after a heroic defence against field marshal Suchet in the War of Independence. Also of note is the Plaza de San Fernando and Plaza de los Estudiantes. From this natural lookout point on the crest of the Sierra Calderona, there are magnificent panoramas of the local orchards running down to the blue Mediterranean. Constructed in the 1st century, this was the first archeological site in Spain to be declared a National Monument i 1896. 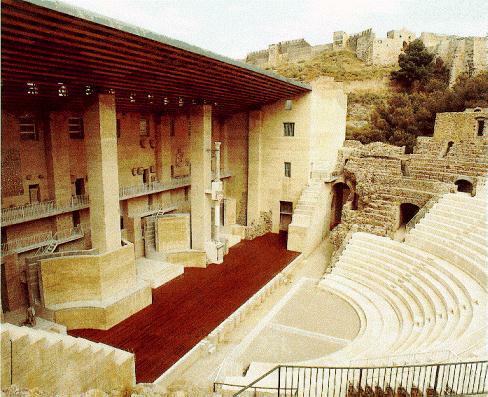 It was skilfully built into a curve of the mountainside and offers exceptional acoustics for the staging o plays and concerts. It was recently rehabilitated to provide greater unity between the stage and the seats, and now offers appropriate conditions for theatre and cultural activities of many kinds. On the eve of Good Friday, the Calvary route is the scene for a representation of the Passion and Crucifixion of Christ, staged since the 19th century. At the top is the hermitage of La Soledad, which the artist Santiago Rusinyol depicted in some of his paintings. Abutting on the church of Santa Maria, the Temple of Diana conserves a wall which is 15 metres long and 4 metres high, formed of gigantic limestone slabs. It was constructed in the 5-4th century BC and was saved from destruction during Hannibal's seige because it was consecrated to the goddess Diana. It has been declared a National Monument. This church, built in the Valencian Gothic ojival style, has an apse and nave facing north which date from the 14th century, a southern portal from the 15th century and a 17th century doorway designed by Gil Torralva and Juan Perez. Of a total of three access doors, two are Gothic and the remaining door, the main entrance, is in the Baroque style, flanked by Plateresque columns. It is now a National Monument. Located in the barrio of the same name, this is a fine example of early Valencian Gothic architecture, dating from the 13th century, the age of Jaime I, King of Aragon. It has a single Romanesque portal set in a round arch. The apse is poligonal with a ribbed vault and a rectangular-based campanile. Built at the beginning of the 17th century in Baroque style, this is the largest hermitage in the town. In the shape of a Latin cross, it has one single nave with a round vault. The cupola shows scenes from the Passion of Christ. Effigies used in Holy Week processions, known as pasos, are kept here, some of which derive from the end of the 15th century. A visit through time brings us to the Jewish quarter, accessed through a portal with a round arch in the Calle del Castillo, known as the Portalet de la Juderia or the Portalet de la Sang (the 'Portal of Blood'). Following the expulsion of the Jews by the Catholic Monarchs in 1492, the Brotherhood of the Immaculate Blood of Our Lord Jesus Christ occupied the former synagogue. The Jewish barrio has narrow, winding streets, houses jostled up against up one another and ojival, or pointed arches over the entries to some streets, making for pleasant strolls for reconnoitring the past. This monument, the lion's share of which is still buried, preserves one of the portals to the Roman Circus, located in the Calle de los Huertos. It is composed of enormous smooth-cut masonry and has been dated to the 2nd and 3rd centuries of our era. In addition to these important monuments, Medieval Sagunt is dotted with other attractive civic and religious buildings: the façade of the 13th century Palacio del Delme; the arcaded Plaza Mayor, the centrepoint of Medieval life, and containing the Puerta del Almudin; the 18th century Palacio Municipal with a Neoclassical front; and various manorial homes with coats of arms over their doorways.